The Census Bureau’s Current Population Survey Voting and Registration Supplement is out! Are you excited yet? The graph on the right comes from Charles Franklin and shows the turnout rate by age for the past three elections. 2008 is in red, and turnout among 18-29 year-olds is up by about two percentage points from 2004, which in turn was up by about eight points from 2000. 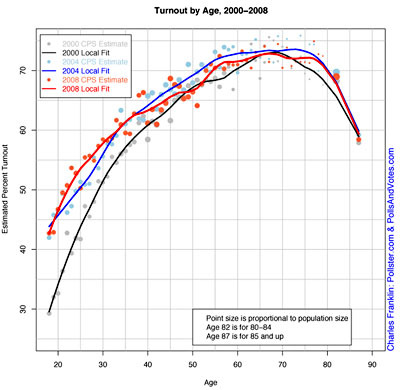 Turnout rates for all other age groups were down slightly compared to 2004. More data is here, compiled by Michael McDonald. Highlights: youth turnout might have been up in 2008, but it was still more than ten points below the turnout rate of every other age group. The turnout rate was down for whites and up for every other ethnic group. And early voting increased from 20% of voters to 30% of voters. In fact, early voting has more than quadrupled since the early 90s.